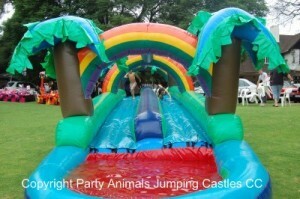 This is the latest addition to the Party Animals range of Waterslides and a absolute hit!! 12m Double Lane waterslide divided in the middle by a bumper, so each person slides in his own lane. Large pool at the bottom where the slides join. Vibrant colours: Apple Green, Spec Blue, Turquoise, Yellow, Red and Orange. Colourful rainbows to support the structure with palm trees near the pool. Dimensions: 12m in length, 2.5m in width and 1m from floor.